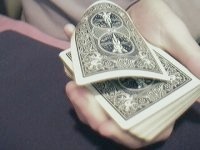 If you want to learn classic and new cardshooting techniques you came to the right place. You will find the older techniques which I gathered through the years since 1999 mainly from books. In the New section you will find new techniques I found on Youtube with clear video instructions. Let’s Start! Grab a deck and have Fun! Here you will find a compilation of the classic shots you will find on this blog. These videos are pre-YouTube and shot in 2000. I will update these videos in the year to come. This shot is based on the simple thumb shot. 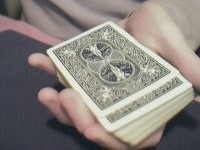 This is probably the most beautiful method of dealing a card and can be used in tricks and at the card table. See Lennart Green perform it and you will be amazed. It’s same idea as the thumb flick shot but now the little finger pulls from the lower side of the deck in a quick motion. Instruction: Get the deck in dealing position. Thumb is resting on the side and the other fingers are on the right side. The index finger and thumb are holding the deck. Give some pressure with the thumb and index finger on the top card. The little finger pulls the card from the deck to the right. Get a bit of a clockwise motion. The card will shoot to the right and is caught by the right hand. You can also just bounds it the right hand like the card is coming from the right hand. You can also do a boomerang with this version by tilting the left hand a bit over to the left. This is looks like the same move as the Top Shot by Green but you give the illusion that you shoot the card from the middle of the deck. : A card is in Lateral Palm in your right hand. With you right hand you pull half of the deck down with your little finger and you let the card flick back so you make the same noise as the thumb shot. At the same time you get the Lateral Palm into view like you have catches it with your right hand. Great to see!! The card is shot from the middle of the deck by the ring finger. Instruction: The deck is held on the tops of the fingertips in the left hand. The ring finger pushes into the deck in about the middle. The ring finger drags the card to the right so it gets out of way of the thumb on the upper side of the deck. When the card is dragged from the deck, the thumb is free of touching the card, the hand turns over so the back of the hand is up. The ring finger swivels (by stretching the finger) out the card. The fastest shot there is! Ricky Jay mentioned this shot in his book “Cards as Weapons” on page 12 but did not fully explained it. Flip Hallema showed me this shot at the Dutch Magic Convention in may 2002. Playing around with cards together with Gregory Wilson for about an hour, Flip did this move and astonished us!! This is a really hard shot that can be a real weapon so must be used carefully. It is a special technique that makes this shot fast as a bullet. Instruction: Grab the deck in your left hand. Thumb on the side. 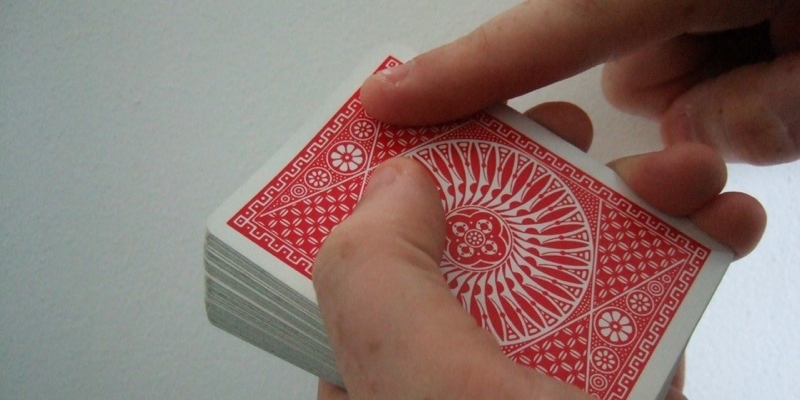 With the tip of your index finger (or together with your middle finger) you push hard on the right corner of the deck and push the card forward as hard as you can. Bevel the deck 90 degrees so you get more strength to push the card forward. After practicing for a while you will find out that if you push the card a bit with a spin to the left and you get the right angle, you can propel the card straight, fast and far! Flip showed us this move as part of a trick: spectator chooses card, with a top switch you show a double card (2 as 1) the card is inserted in the middle of the deck (part of ambitious card move) and he shoots the top card from the deck being the spectators card to find on the other side of the room. Inspired by Lennart Greens Flourish Z Cut, I found a nice new method which gives me inspiration for new ideas. When you do the basic flourish Z cut, you will normally take the middle portion of the deck clipped between your ring finger and the thumb. If you start to do the Z cut, push the top portion to the left. For the shot you do not clip the card with the ring finger but flick the top card of the middle portion of the deck. Now the card shoots sidewise and you can finish the flourish Z cut. 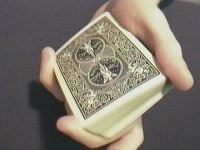 Card are held in dealers grip in the left hand with thumb stretch on the left side of the deck. Thumb slides top card a cm (0.4 inch) down. The little finger bends the cards toward the base of the thumb and pushes in and downward, letting the card shoots from the deck to the right. This version is by myself and it is very easy to do. 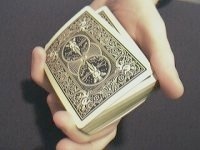 Spread the cards (with a pressure spread flourish) and with the right hand you take half of the spread. 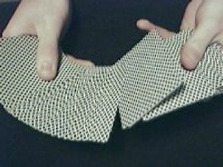 You push with the right spread on the top card of the left spread and you push a bit to your right. The card will shoot from the top of the left spread. 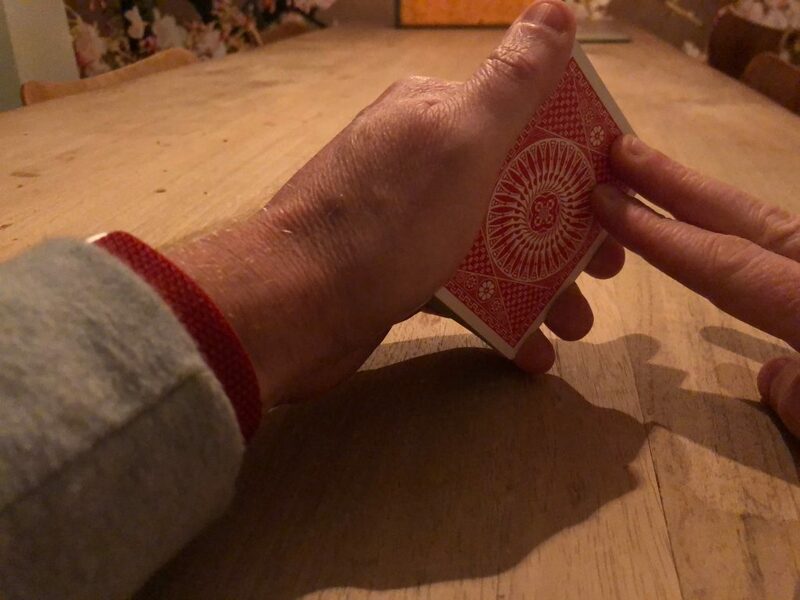 “Shot Pass Direction” by van Venrooij: I have came up with a variation and a routine on the first ring finger shoot method which you can use if you are in the pass position and a way to get the eyes of the deck while executing the pass. I think this is an original so use it but credit me! 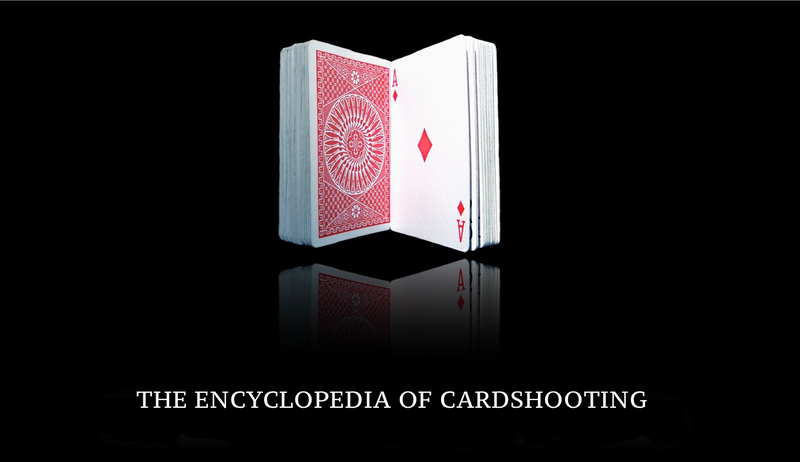 Shoot the card out of the deck which is just above the selection (above the break). You shoot the card and do a pass. This is a good way to cover the pass because everybody is looking at the card which just left the deck. Get a 52 on 1 card and shoot this card and ask if their card is on it (duhh!). Execute the pass and you got the card on top. Great way for misdirection (or direction as Tommy Wonder would say!). If you are in pass position, move the thumb to the left top of the deck and when you move your right hand out of the way you shoot directly. It’s the same shot as above but you do not turn you hand and you do the dragging of the card (to get it free from the thumb) under the cover of your right hand. This one is undetectable!. Gregory Wilson showed me this one at the Dutch Magic Convention in 2002. He told me that he invented it by accident while he was practicing for the one handed palm. Just like you do the one handed palm from the deck, shoot the card forward by getting some free space from the thumb. Just push with you little finger on the right top corner of the deck.